Tai Chi at Church House. Every Tuesday morning during term time starting at 10am and finishing at 11.15am. 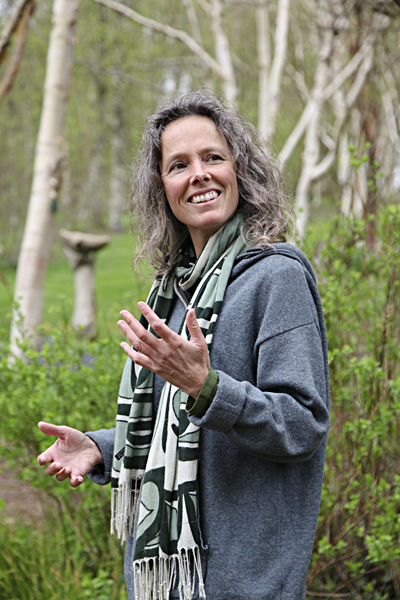 A relaxed, informal and fun class for people of all abilities. Beginners welcome. Background:The local church has tried for years to harness the commitment of local (non regular, but supportive) people to help finance the on-going life of the local church. Some villages have active ‘friends’ groups who are an enormous help but in reality they are few and far between. This list is probably in popularity order. There are also often local traditions / festivals which are part of the villages story which often have an act of worship as part of them and tends attract non regulars. 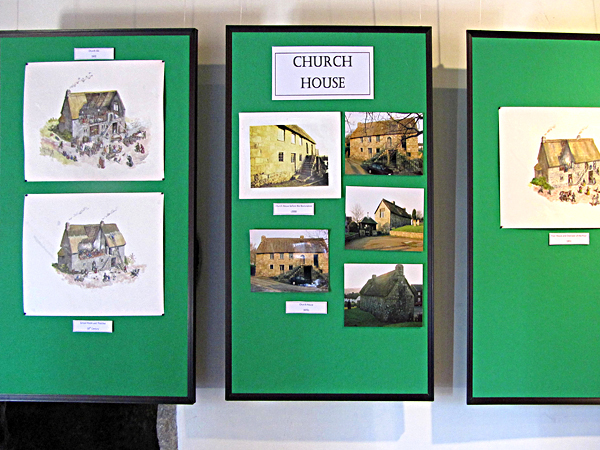 d) Visitors books tell us that people use our church buildings as tourists or returners and are pleased to find it open. For those churches where the ASA is negligible and where the regular Sunday worship is deemed no longer viable rather than pursuing church ‘closure’ to invite the Local Community to make a bid to become a ‘FESTIVAL CHURCH’. This is to AVOID church closure and needs to be presented as such to the local community. 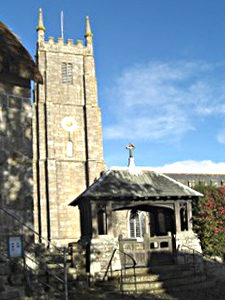 The building would be kept water tight and wind proofed, church yard maintained and insured. Arrangements could also be made locally regarding key holder and access to the building for visitors or open on a Sunday for private prayer. If as a village felt they wanted to become a ‘Festival Church’ they could apply to the Diocese, who would provide them with all of the above at a locally determined cost PA. Cost of basic building maintenance and cleaning before festival services and occasional offices. This would be the cost to ‘The Village’ of being a Festival Church and saving their church from ‘closure’. The village can then determine how this cost might be met. Here are a couple of pictures of our Church House parties. Hope they are some use to you. We had a magical time at both parties! Just a bit of personal news today. I am the webmaster for this site and, for those who don't know, I now manage the site from France, having moved here just before Xmas 2006. When I was living in South Zeal it was quite easy for me to get local information and photos for the site but now I have to rely on submissions sent to me by email or the Cloud. If you have looked on this page lately, you will have seen that there are very few submitted news items. For me, it means less work but it does make the site less interesting for the local community. together with any graphic (photos, posters, etc) publicity material you have. winters are far colder than in Devon) so I started using a laptop downstairs instead. and to replace all my programs as well as copy my data back onto it. - those paid for and those free. The paid for ones need activating with a code and if you have not saved these codes you can be in trouble. now and again. If you want to keep old emails, save these as files on the backup disk. This is not a comprehensive list of things to save, everyone's machine contents are unique. But remember. My wife kept telling me to buy a new machine as my other was creaking along. I didn't listen! My name is Danielle Moore-Dunstan. I am the new Police Community Support officer for Okehampton rural East. I have been covering Okehampton town for the last 4 yrs and previous to that 2 years with PC Nadine Wilson in rural east so am aware of some of the local concerns. I will be conducting foot patrol around my patch which includes Sticklepath, North Tawton, Sampford Courtney, Exbourne, Spreyton, Throwleigh, Chagford, Gidleigh areas. Also being involved with the local schools and community events, monitoring speed and dealing with local concerns from residents. I would like to remind residents particularly in rural locations to keep sheds & outbuildings secure and check that lighting is working and that boundary fences/gates are also in good order. Please be vigilant as the better weather approaches and ensure that garden equipment especially petrol operated items are secure after usage. Most items can be security marked or tagged now and this helps to drastically reduce the appeal to potential thieves. Please contact local police on 101 for advice. Currently the annual “Moorwatch” scheme is being operated by Police whereby local beauty spots and rural car parks that may get targeted by criminals are patrolled and security signs are on display to visitors, in conjunction with security reminder leaflets distributed on cars. Do not leave keys in cars or appealing items on display when you are leaving your vehicle unattended or whilst parked in beauty spots. Dartmoor National Park are working alongside Police and also have rangers patrolling the car parks in an attempt to deter criminals. Please call 101 if you witness driving which you are concerned about or have information regarding a potential drink driver as we want to educate drivers and reduce the amount of potential accidents and people killed on our roads. Information can be given anonymously. 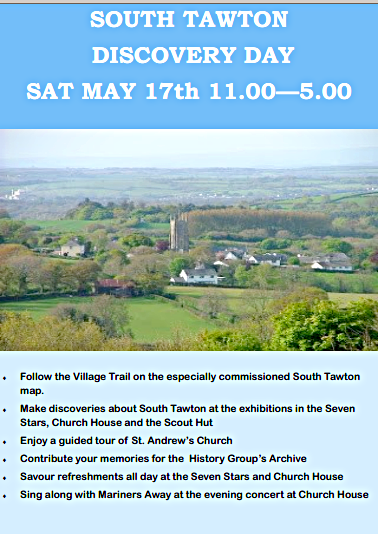 The sun shone on South Tawton on Saturday and there was the usual good response from the village to the various attractions on offer. The Mariners Away concert raised £275 for RNLI and the Scout Centre in the village received around £175 from all the given refreshments during the day. These photos were taken before the crowds arrived and unfortunately the organisers were too busy after that to take any more. 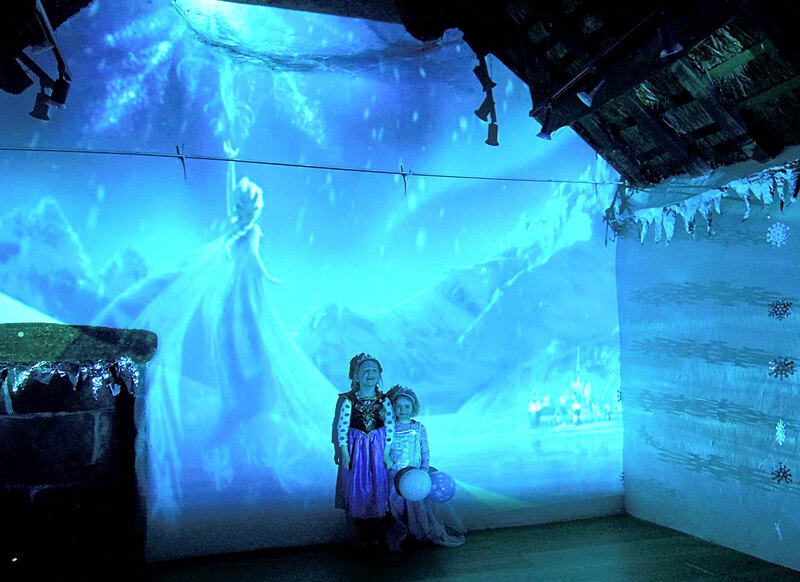 These photos show potential hirers how the top room can be set up for an exhibition. 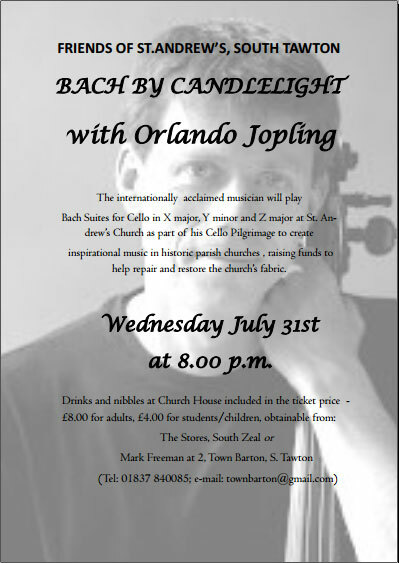 (donations of cakes very welcome). 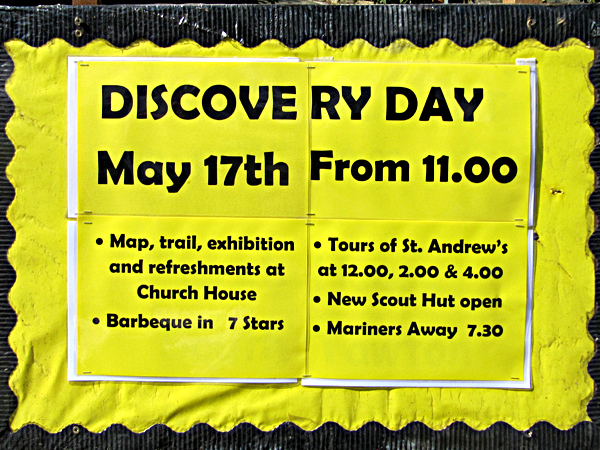 All profits from the day will be donated to the Ist Zeal Scouts to assist them in the costly refurbishment of the Scout Hut. e-mail: davidyoule@btinternet.com. 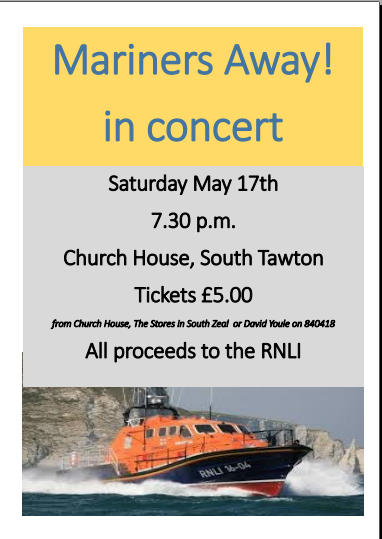 All proceeds from the concert will go to the RNLI. Do you know any budding Authors, Songwriters or Poets? and is looking for new material to publish. The site can be viewed on tablet, laptop or PC but is sized for best viewing on smartphones. To check it out look at www.mobile-story.com and if you think you know any individual or group who may like to contribute, please pass on the link. 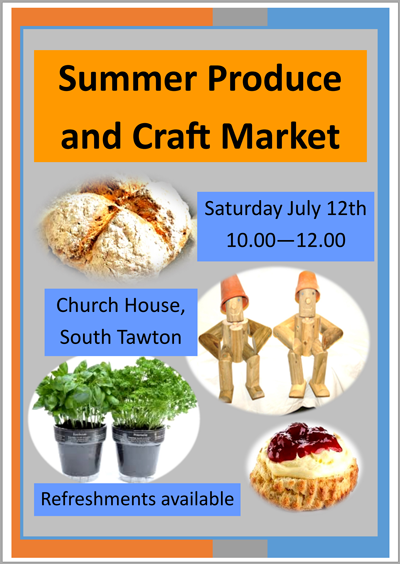 18th July 2013 - South Tawton Market. For a change suffering from the GOOD weather! Check out the site - Saint Andrew's Church at Risk to see how important it is to try to save the structure of our local historic building. The Silent Auction on November 10th turned out to be a great success. A steady stream of prospective purchasers viewed the 100+ items on offer throughout the day - and the final half hour saw a positive frenzy of bidding as the crowds packed into the upstairs hall and sought to secure lots. Many thanks to all those who contributed to the success of the event – whether delivering leaflets, receiving and displaying goods on the Friday afternoon, providing refreshments, stewarding or helping with the aftermath of the event on the Saturday evening and Sunday. At the time of writing, a handful of purchasers are still to collect and pay for their lots, but Church House, which is run by a management committee independent of the church, will be presenting the Church Roof Appeal with a cheque for approximately £1,170 – a magnificent sum. A big thank you is in order to all those who offered goods for sale, purchased lots and made donations. 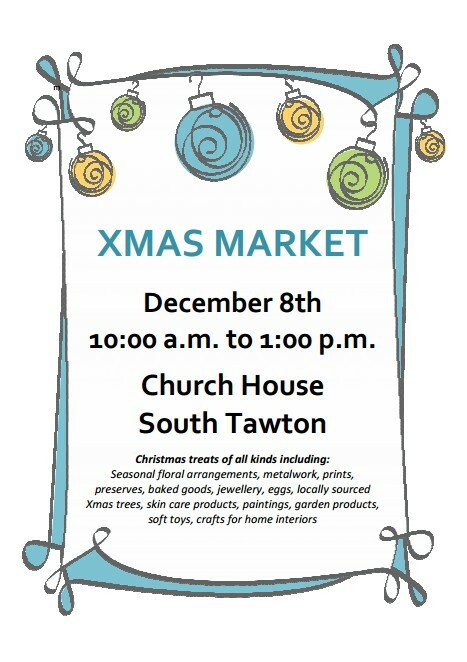 Attention now turns to the next Church House event – the Christmas Market. This will take place on Saturday December 8th from 10.00 a.m. – 1.00 p.m.
Richard Penney: selling quality knitted toys, photographs and pickles and chutneys. At the time of going to press we are waiting for confirmation of attendance from other traders. 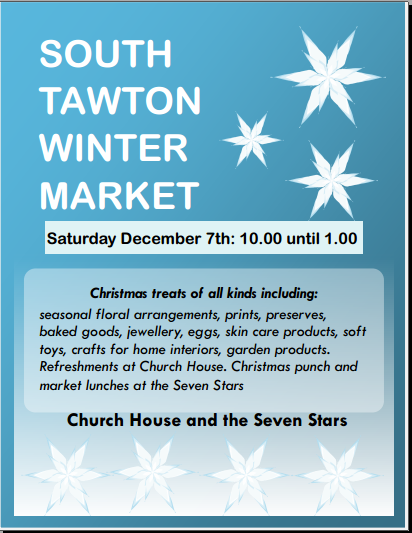 If you would like a stall, please contact Mark Freeman (e-mail: townbarton@gmail.com, tel: 01837 840085) although we will be restricted by the number who can be accommodated within the building. Starting May 2013, the public opening on Wednesdays will be discontinued due to the greatly increased demand for group lettings during the week. Sundays: 11 am - 5.00 pm. Entrance free. Cream Teas. Vendors will be charged £2.00 per lot submitted for auction (non-returnable). Most lots will be single items. However, items such as a pair of vases or a set of plates would be classified as a single lot. Vendors are responsible for ensuring that items submitted for sale are in good condition and working order. Please note that electrical items cannot be accepted. The auction closes at 4.00 p.m. Successful purchasers will be contacted by telephone. Church House will be open for collection of lots and payment for goods (cash or by cheque made payable to The Church House) on Sunday November 11th from 2.00 p.m. – 4.00 p.m. Arrangements can be made for collection at an alternative time during the subsequent week by agreement. Vendors will be contacted and paid for lots sold by Monday November 19th 2012. 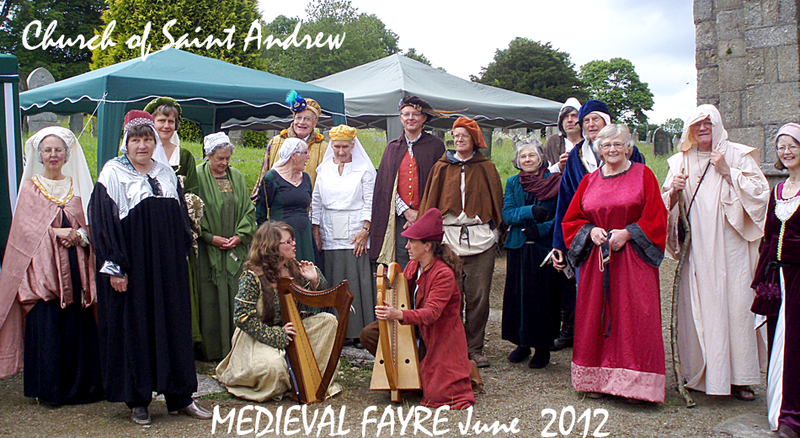 Lots unsold can be collected by vendors on Sunday 11th or by arrangement at other times. Lots not collected by Monday November 19th will be donated to charity. 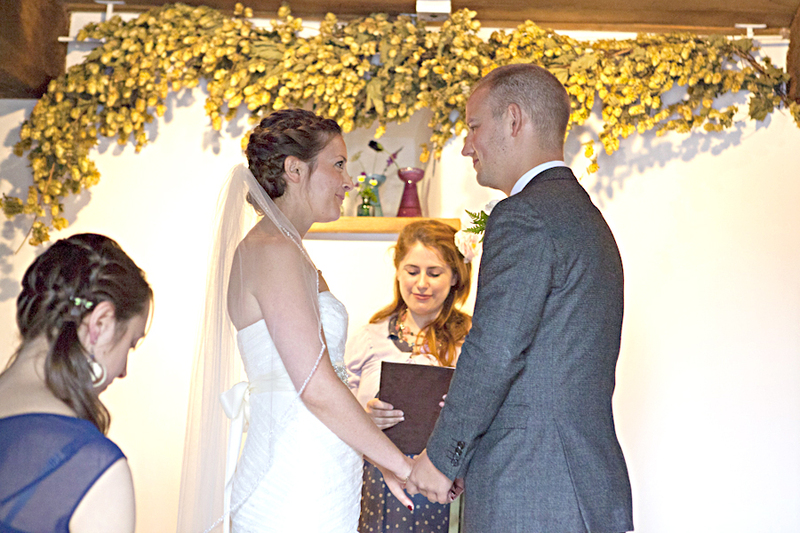 In August 2012 Christian and Laura Archer celebrated their wedding at Church House. Following the legal wedding ceremony at Okehampton Registry Office three days earlier, what for them was their real marriage service took place on Saturday August 4th. The ceremony, conducted by a Humanist celebrant from Oxfordshire, was held downstairs, followed by photographs and drinks outside in the square. The party then moved to Laura’s mother’s house at 2 Town Barton for more photos and canapés. 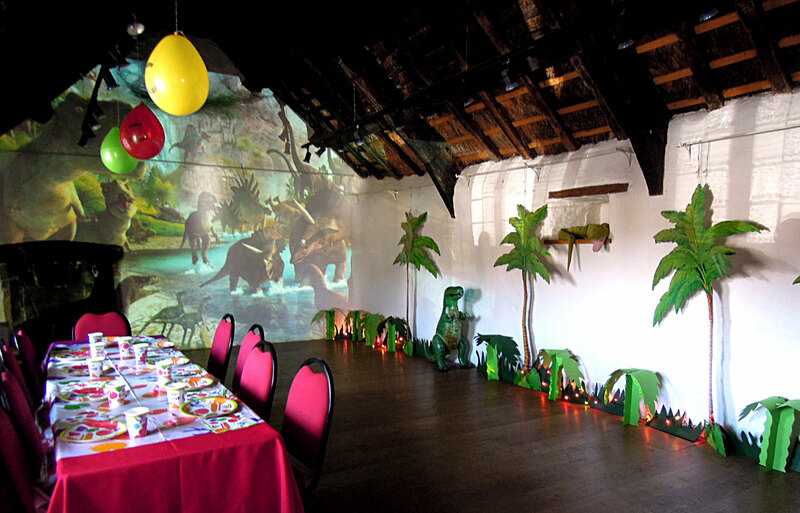 The wedding breakfast took place upstairs, with the buffet being set out in the adjoining East Chamber. This was followed by a disco downstairs and culminated with a firework display at Town Barton. The photographs show how the venue can be used very successfully for a small wedding (seating upstairs limited to forty eight). Catering can be provided, if required. For further information, please contact David Youle on 840418 or Mark Freeman on 840085. Making Marks is an exhibition from the South West based collective CanzArt and is as far ranging as the title suggests. From the early cave art of the Neolithic period people have been making marks on rock, wood, canvas and paper as both a form of communication and expression, and mark making is at the heart of these artists’ work. Whether it be marks in a sketchbook made at the bottom of a field or high on Dartmoor, or thick impasto acrylic layered on canvas in the studio, there is a continuing discussion between the artist and the work, where the marks form part of the dialogue that leads to the finished painting. Making Marks though is about more than just the surface appearance of the painting. It’s about the inscribed, the indented, the mark laid on mark, thick acrylic and oil, the scrubbed off and the delicate watercolour wash, floated across the surface. Each of the artists responds to their chosen subject in a unique way, illustrated by the deep sensitivity of line and pattern of Derek Stirland’s coast and moor work; Ron Pyatt’s paintings and prints that combine the marks of both observation and memory linked to myth and landscape; the gestural but detailed figurative paintings of Paddy Langworthy and the delicate watercolour marks of Vera Johns whose understanding of light and shadow brings the paintings to life. 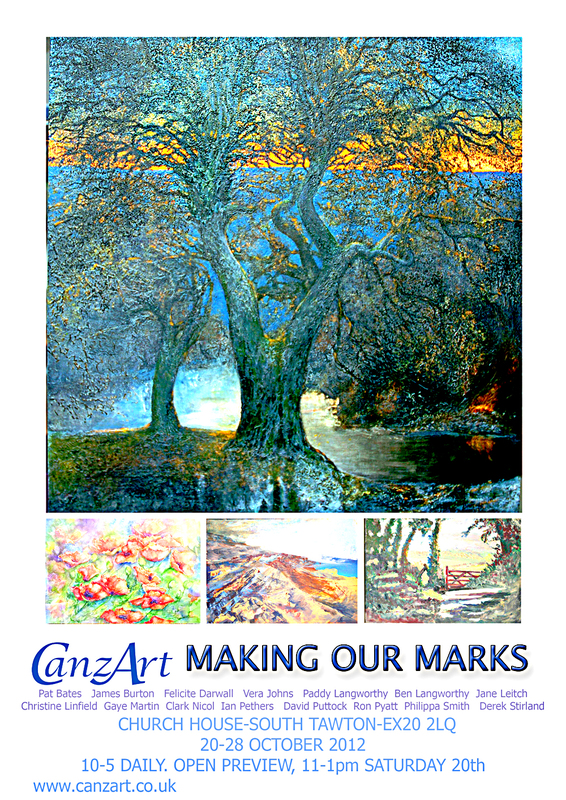 CanzArt is a collective of contemporary artists who live and work on Dartmoor, West Devon and East Cornwall. Established in 2003, their work ranges from the abstract to the illustrative, encompassing sea and landscape, portraiture and still life. Current membership includes professional and semi-professional artists: Pat Bates, James Burton, Felicite Darwell, Vera Johns, Ben Langworthy, Paddy Langworthy, Jane Leitch, Christine Linfield, Gaye Martin, Clark Nicol, Ian Pethers, David Puttock, Ron Pyatt, Philippa Smith and Derek Stirland. Do you have items stashed away in the utility room or garage or attic which you keep meaning to get rid of, but you never quite get round to it..? 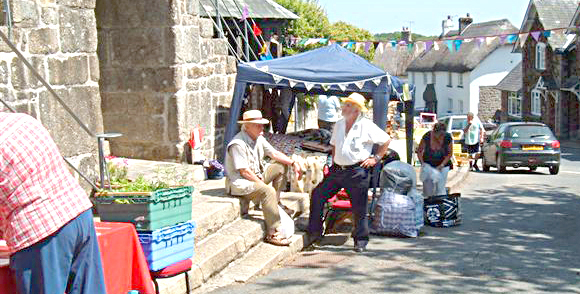 How about making a resolution to finally do something about the situation and bring your unwanted (by you) but desirable (to others) possessions to South Tawton’s first Car Boot Sale from 9.00 – 2.00 (vendors from 8.30 a.m.) on Saturday September 22nd in John Darch’s Field (just before you enter the village from the Okehampton side). 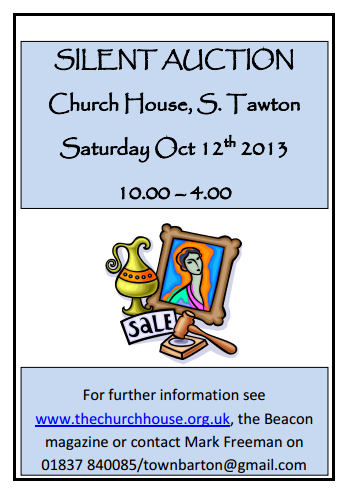 Admission for prospective purchasers is free and refreshments will be available from 9.30 a.m. at Church House. 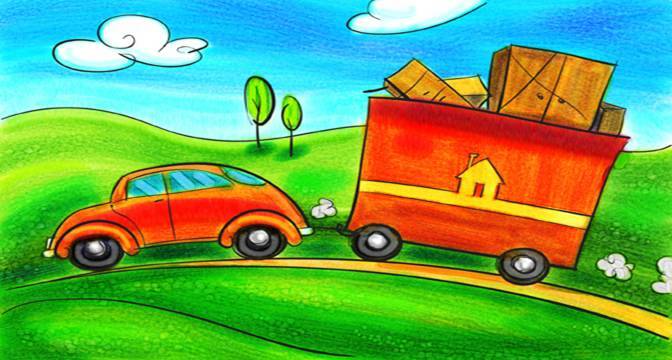 The Car Boot Sale takes the place of the Yard Sale originally advertised for September 8th. There will be no sale or market on that day, but there is still plenty happening. 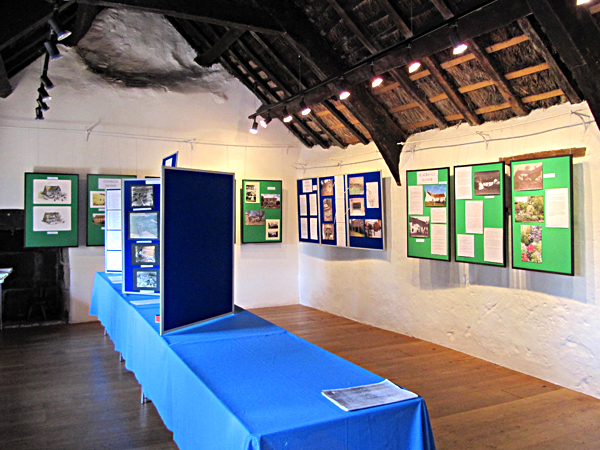 The STAGS Art Exhibition will be open from 11.00 a.m., St Andrew’s Church will be open for the Historic Churches Trust Ride and Stride and Church House is celebrating National Heritage Open Day (sponsored by English Heritage). The next monthly market will be on Saturday October 13th. 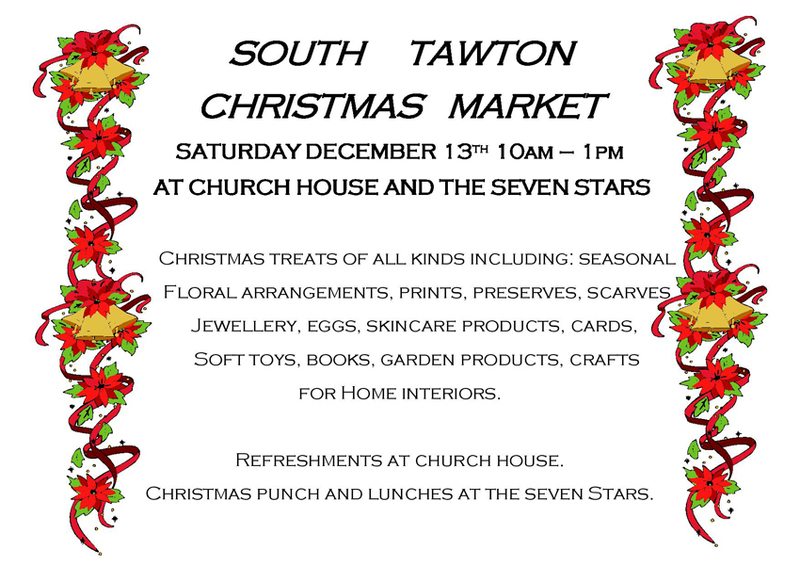 If you would like to have a stall or receive further information, please contact Mark Freeman on 840085 or e-mail townbarton@gmail.com. We are planning a Village Square tidy-up before autumn sets in – weeding between the setts and along the kerbside and planting more bulbs for the Spring. If you have an hour or so to spare, please join us (with appropriate implements) on Sunday September 16th at 2.30 p.m.
Stretch,strengthen and balance your body. Pilates targets the deep postural muscles within the body through a series of exercises, focusing on spinal health and postural awareness. Retain your core to support your back, as it was designed to do. 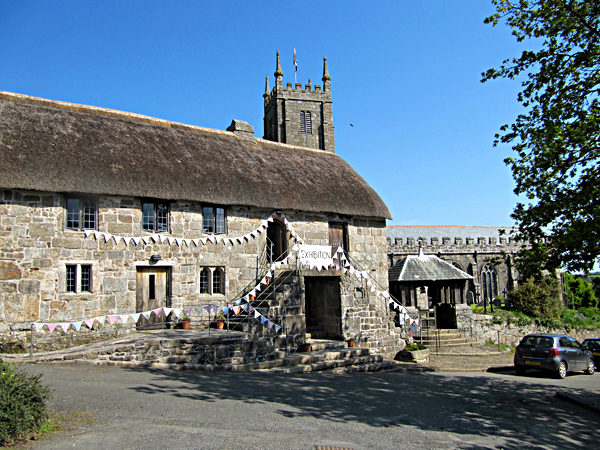 Classes in Church House, South Tawton on Thursdays 9.30 - 10.30 am £4 per class. Please bring an exercise mat along. 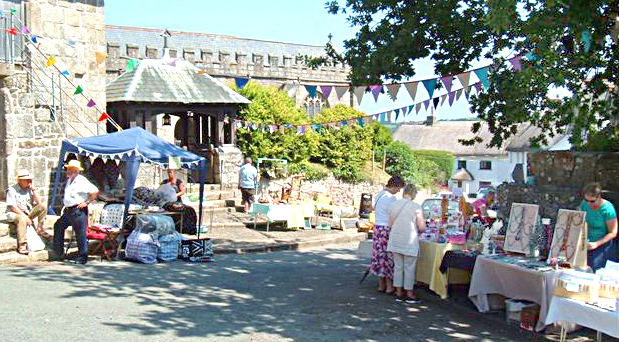 The May market saw sunshine, an increase in the number of stalls selling produce and crafts – and, unfortunately, a reduction in the number of purchasers. It is hoped that, at the next market in July, we will succeed in having the balance of vendors and customers to stimulate trade and make the market sustainable. 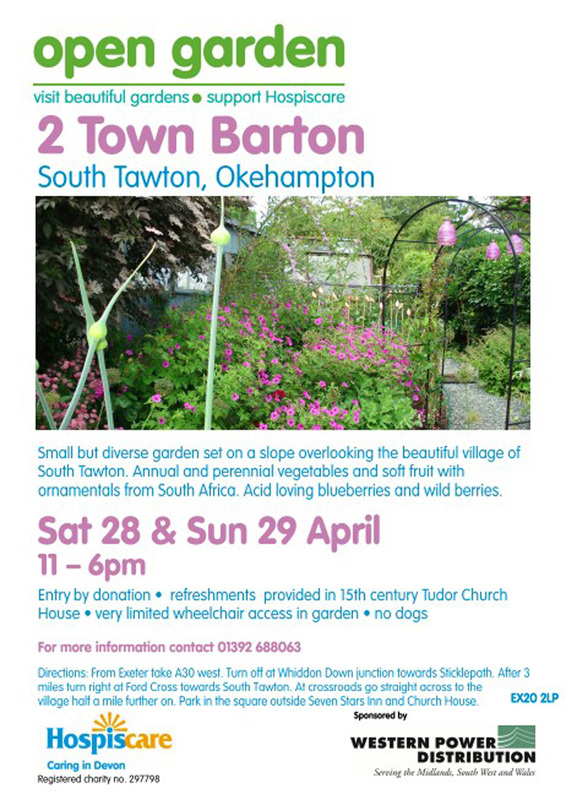 If you would like to have a stall yourself (or share one with a friend), please contact Mark Freeman (e-mail: townbarton@gmail.com, tel: 01837 840085). One wet and blustery Sunday afternoon in April a group of villagers weeded between the setts and the slabs around the square. 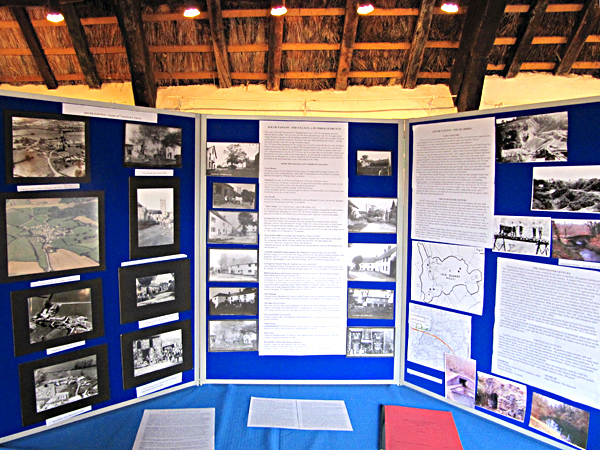 Many thanks to Peter, Pat, David, Nick, Kate, Di and Jeremy for their sterling efforts. Dave Sampson has done a magnificent job restoring the bench and Kate Norman has stripped and oiled it so that it should do several more years of service. 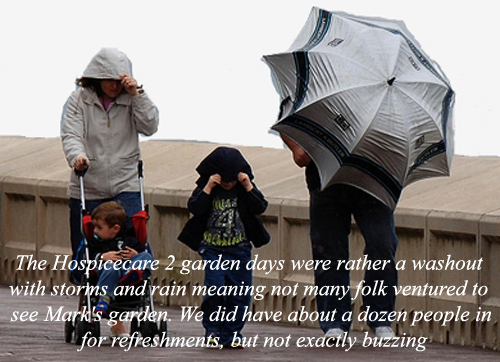 All we need now is some sunshine to enable people to use it! Alan Wright has come up with one of those bright ideas which none of us wrestling with the problem of the area in front of the notice board had thought of. The answer is simple really – move the board! The plan is to place the board to the right of the grit bin so that people no longer have to tread in the mud to get to it. The dog waste bin can go at the left hand side of the flower bed and a litter bin to the right of the bench. We are going to plant creeping thyme and a low growing plant called rupturewart between the setts and the slabs to see whether they will take and reduce the amount of weeding required for the future. We would like some more geraniums or other plants which might thrive in the difficult conditions underneath the oak tree to continue to make the village centre attractive once the tulips have stopped flowering. If you are splitting any plants which you can let us have, please leave them with Mark or Susan Freeman at 2 Town Barton. Thank you so very much for all the information and the lovely welcome you gave me and my group at Church House today. My group is a very disparate group but all of them truly enjoyed our visit and have said to me how it was the highlight of the day. We all enjoyed the privilege of being able to visit the wonderful building and hear of the details of the work undertaken. Please pass on our thanks to Mike Bailey and to the very kind lady who gave us the lovely tea. It all made a perfect climax to our day. 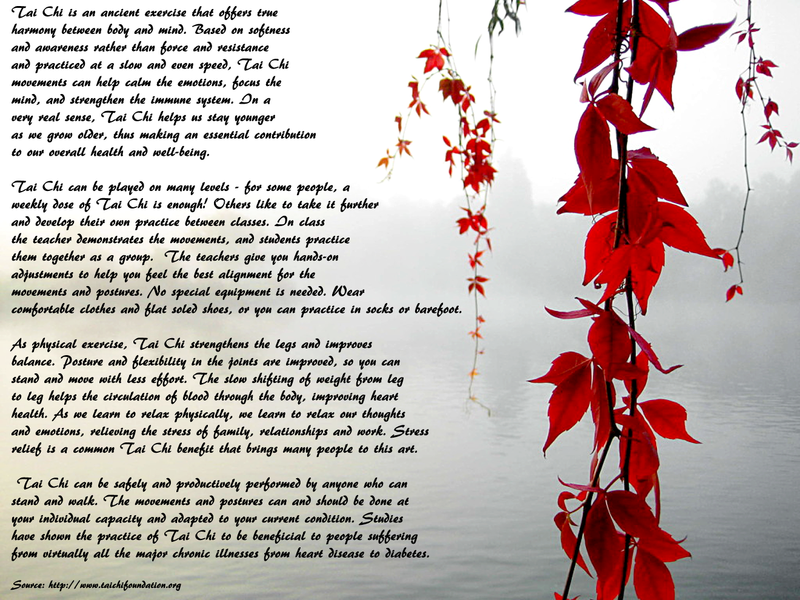 civilized approach to the work you all do for the Church House and for the welcome you extended to us. I think that your village is fortunate in having people like you and mike in the community. Numerous traders were unable to attend the March 10th market for a variety of reasons and, therefore, the market had to be cancelled. 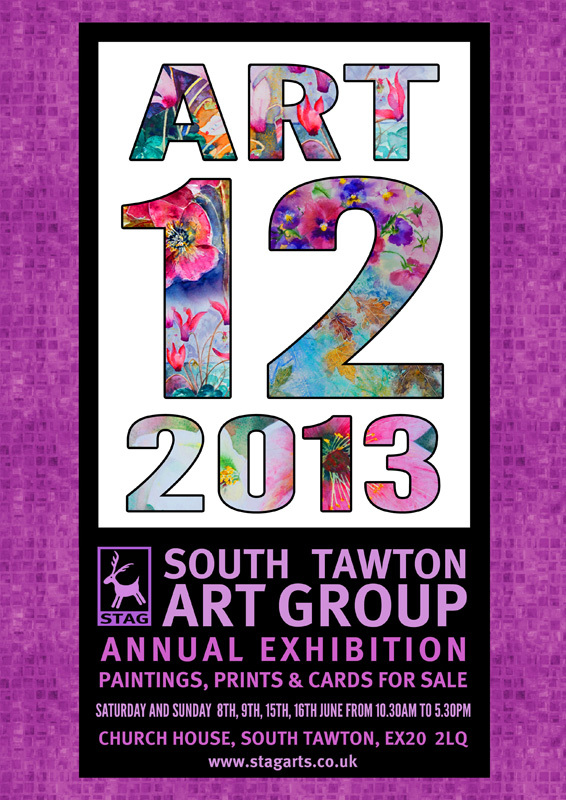 Thankfully, most people saw the cancelled posters and only a handful of disappointed purchasers turned up. Many apologies to them. April’s market is definitely happening! 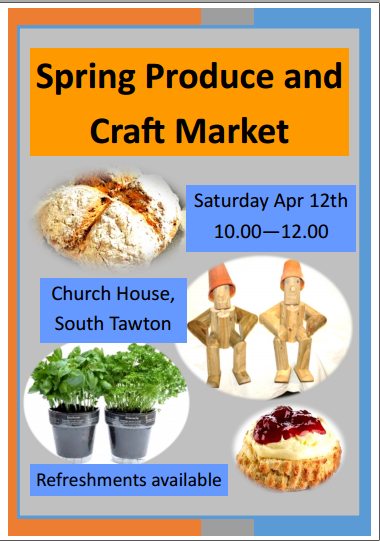 At the time of writing (four Saturdays before the event) many stallholders have already confirmed their attendance for the market on April 14th. The village square remains bright with flowers at the time of going to press. The bench is in the throes of being refurbished and reclaimed slabs have been purchased to pave the area in front of the notice board. Help will be sought for this endeavour. 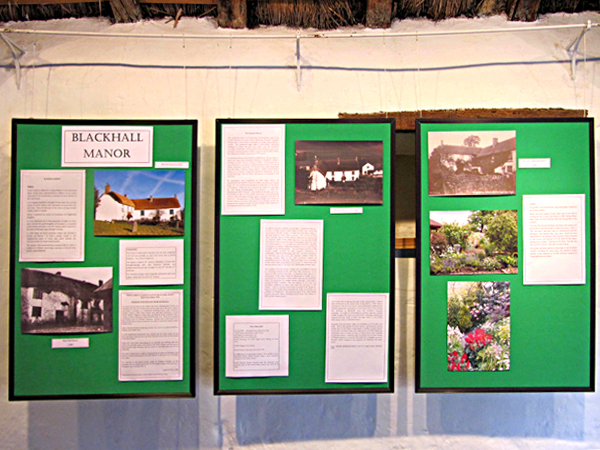 Watch the village notice board for details. The dog waste bin will be positioned at the same time as the slabs go down.